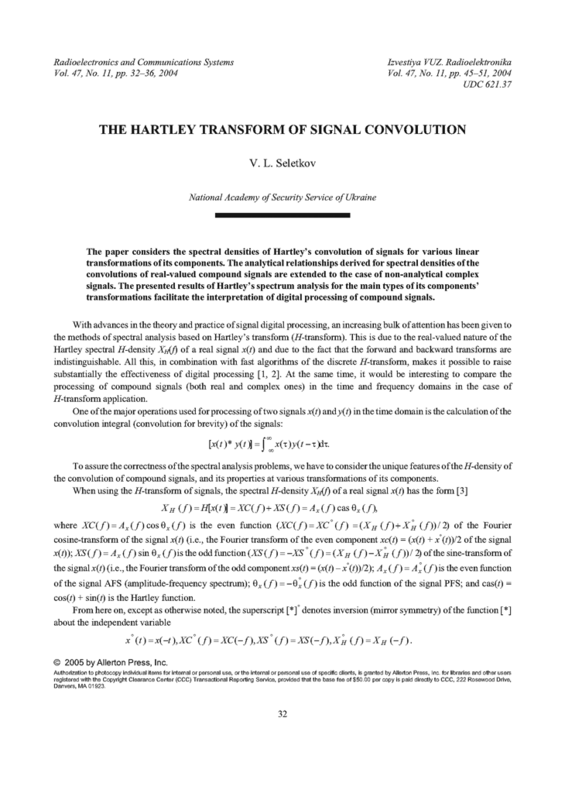 The paper considers the spectral densities of Hartley’s convolution of signals for various linear transformations of its components. The analytical relationships derived for spectral densities of the convolutions of real-valued compound signals are extended to the case of non-analytical complex signals. The presented results of Hartley’s spectrum analysis for the main types of its components’ transformations facilitate the interpretation of digital processing of compound signals. MARPLE, S.L. Jr. Digital Spectral Analysis with Applications. New Jersey: Prentice-Hall, 1987. R. Bracewell, The Hartley Transform [Russian translation], Mir, Moscow, 1990. SELETKOV, V.L. "Correspondence of signal processing operations in using the Hartley transform," Izv. VUZ. Radioelektronika, v.45, n.8, p.49-55, 2002.